Khirbet edh-Dharih was established as a Nabataean village on a mountain slope overlooking Wadi al-La'ban, a tributary of Wadi al-Hasa in southern Jordan. An outstanding temple with elaborately carved facade, that stood up to 15m high, was built in the village around AD 100. The temple facade was designed according to classical fashion. It contained major constitutional elements of classical architectural order, but its decoration was not classical at all. Excavators found the temple in ruined heaps, but fortunately they could recover hundreds of fallen stone blocks that enabled them to reconstruct major parts of the temple. The architrave of the temple facade stood around 10m above ground. It was decorated with carved vines and animals, and had Medusa heads at the corners. The frieze above had figures of the Zodiac alternating with winged Victories, who crowned these figures. The discovered zodiac figures are, from left to right, Taurus, Gemini (figured as Dioscuri), Cancer, Libra and a fragment of a cuirassed Sagittarius; the others are very damaged or missing. At the top, a triangular pediment had sea centaurs (Tritons) with long twisted tails, crowned by flying Victories and fishes at the ends. Standing eagles guarded the central figures, which were certainly the most important for the temple. Only fragments remain to indicate what these were: a section of the head of a bearded deity (possibly Hadad / Dushara) and fine cornucopiae that suggests a female deity, possibly Atargatis / al-'Uzza. 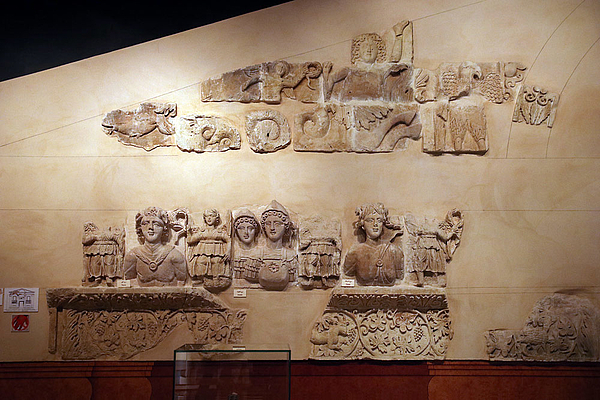 These two were the main deities at the nearby Nabataean temple of Khirbat at-Tannur. The discoveries in 1998 to 2001 generated discussions among scholars: is the zodiac depicted here a sign of an astral Nabataean cult, or does it represent the local adoption of the zodiacal calendar that was known in several contemporary cultures? 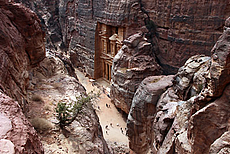 Informative visual tours to the highlights of the ancient city of Petra, showing trail options in several chapters with orientation through interactive maps.